Do you have the right logo for your small business? Are you thinking about a logo design? Do you find yourself being able to convey the right company message? A logo can go a long way in communicating your brand to your audience, and you can put it on everything from business cards to logo mats to wall art. Whenever someone enters your small business, they shouldn’t have to question where they are. The problem many companies face is towing the line between communicating the right message but also not being overwhelming. According to the Huffington Post, companies should focus on keeping their logos simple. If you’ve found that your previous iteration is outdated, go for a logo that has staying power. Every brand will do a refresh every so often, but it’s important to make sure that the message is crisp and stays current through different trends. While you should make the overall design simple, that doesn’t mean you can’t use some color to make it pop. According to Mashable, colors are very important in evoking feeling. Think about your business and whether you want to use big, bold colors to grab attention, or if your clientele would respond better to neutrals and muted tones. Even a few simple changes of color can go a long way in conveying the brand. Ambiance goes beyond the entrance. If you’re a business that welcomes clients through your doors on a regular basis, you need to think about the image you’re putting out. It goes beyond having employees to greet people. Instead, think about what kind of message the decor in your office puts out. From the customized entrance mat to greet anyone who enters to the wall hangings, the theme of the office matters. According to Investor’s Business Daily, you’ll want to think about the ambiance you’re giving off to clients. For example, if they’re sitting in uncomfortable chairs while they’re meeting with you, they may be distracted or even try to wrap the meeting early. Be sure the furniture is comfortable with a level of firmness that won’t have clients simply sinking in and feeling as though they can’t get up. The news provider also reports that ambiance can include music. In the lobby, consider having some light, classical music that adds a little something extra to the mood of your space. This can go a long way in greeting guests. Think about the smell as well. Inc. reports that this can provide guests with a nice memory, rather than whatever if cooking in the kitchen. Just be sure the scent is not too overpowering. Add some personality to the small space with entrance mats. When you have a small office space, you need to get creative with how you present your company. It can be a challenge to decorate appropriately when you don’t have much room to work with, but little additions like a logo entrance mat or a wall hanging can add a lot to the personality of the small space. Fast Co Design reports that there are plenty of ways to make the most out of a small space. The news provider says some companies are working with small spaces by choosing elevated desks and tables to effectively stack work spaces. This can also help employees feel slightly separated from the chaos that can sometimes come from a small office. The Wall Street Journal reports that office spaces are growing increasingly small, having decreased by 21 percent since the 1990s. The news provider suggests picking sleek office furniture to really stand out. Making sure it’s not too bulky or large is the best bet, since you want to conserve as much space as possible. The news provider also suggests that where applicable, using glass walls instead of regular ones can make an office appear bigger. However, checking to make sure they still muffle sound is also important. Logo mats can help keep the floors dry and pristine. You want your lobby to represent your business in a way that’s both inviting and informative. 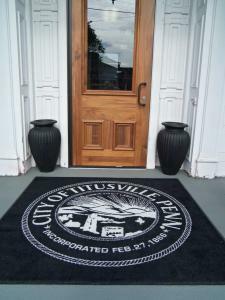 When rolling out the welcome mat, choose an entrance mat with your logo on it, so guests know exactly where they are. If you have company colors involved in your logo, the lobby is the time to bring them out in some way, as it will reflect on the rest of the office space. Buildings reports that a lobby is the first and last impression a business can leave, so managers have to make sure it properly sets the tone of what they are trying to convey to anyone who enters. The news provider also suggests that while it’s important to have personality, a lobby should have mass appeal in order to make it inviting to any visitors. The news provider suggests managers should really take the time to think about the kind of message they want to convey to their visitors when choosing how to design a lobby. According to Building Design and Construction, you also want to keep the lobby floor dry at all times, which is where entrance mats can come in handy since they can absorb any moisture guests would track in from the outside.